I had no idea that the corpse flower existed! Thanks to your informative post, I emarked on a google image search. Some are huge! 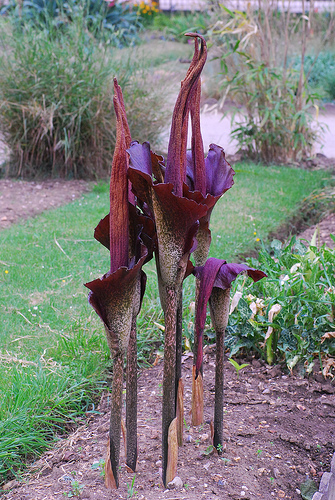 They appear attractive, but it's really hard for me to imagine a plant that actually smells like rotting flesh. I don't think I will complain about the bees anymore. If I'm not killing plants, then I'm not stretching myself as a gardener? Then I must be made of rubber bands because I've killed a lot of plants. :o) My experiments in zone pushing have been a bit expensive because I keep buying the plants again after they die so I can try them again in a new spot. What these guys have accomplished is quite impressive. They must pray for warm winters while I 'm hoping for snow. Killing plants and stretching yourself may be a marketers dream. Guilt and forgiveness wrapped up in a potted plant. Thanks for stretching! I love different stories about plants. I love to watch different straker translation reviews on this topic and watch different pictures. Thank you for this post. Tropical landscapes help me to write for http://pickwriters.com/top-10-translation-services my essays and translations. I can't imagine any other place that would inspire me more.